Diwali is a time when the winter vegetables and fruits are already in the markets and many of them are here just for a couple of months. Water chestnuts are one of those seasonal produce that stay for a couple of months only around diwali season. Most people in North India use water chestnuts during Navratri fasting, in our home we keep eating them all through the season and always get a huge bagful of water chestnuts from our weekly market. We eat them raw or stir fried, or we boil them and add them to salads or eat as is. A water chestnut and sweet potato salad with feta cheese and a mung sprouts, sweet corn and water chestnut salad keeps repeating in some or the other form at out our table. A really tasty halwa with fresh water chestnuts (actually a pudding) is a perennial favourite in my home. Peeling them is quite time consuming but once you take care of that it will be a pleasure on the table. Using water chestnut to make a quick dessert for Diwali would be wonderful if you want to avoid the regular mithai and cake-donut rut. I know you are extremely wary of the store bought mithais (if you are reading this) in the festive season as all those are prepared quite early to meet demands on the D-day and is loaded with sugar, trans fats and artificial colours apart from the regular culprit white flour (maida) and others of that ilk. I also realise we don't usually have the luxury of making mithais at home for a festivals and buy the stuff just to get the feel of the festival. Making some quick desserts that look good too will be quite sensible if you ask me. I am sharing 2 of those here, each one can be cooked within in 15 minutes flat and then chilled before serving. Here is a fresh water chestnut panna cotta that I cooked some time back and sent the recipe as guest post for Pratibha's blog. Water chestnut is used as a thickener in this recipe and a gelling agent too as it sets into a nice jelly when it is cooked and chilled. I use the same procedure with some tweaks to make a few more desserts as the gelling property of fresh water chestnut puree can be used to make pudding like desserts easily. For this fresh water chestnut panna cotta I cooked 200 gm pureed fresh water chestnut puree along with 80 ml heavy cream and 50 gm sugar till the mixture starts thickening and big bubbles arise and burst spitting out hot air. Added 2 tsp rose water and mixed well, poured into serving glasses and chilled. That's it. .
Use the mature and hard water chestnuts for this recipe as those have more starch and gel well. If you have tender water chestnuts you can add 1-2 tsp of corn starch to enable the panna cotta to set well or a little gelatin if you wish. 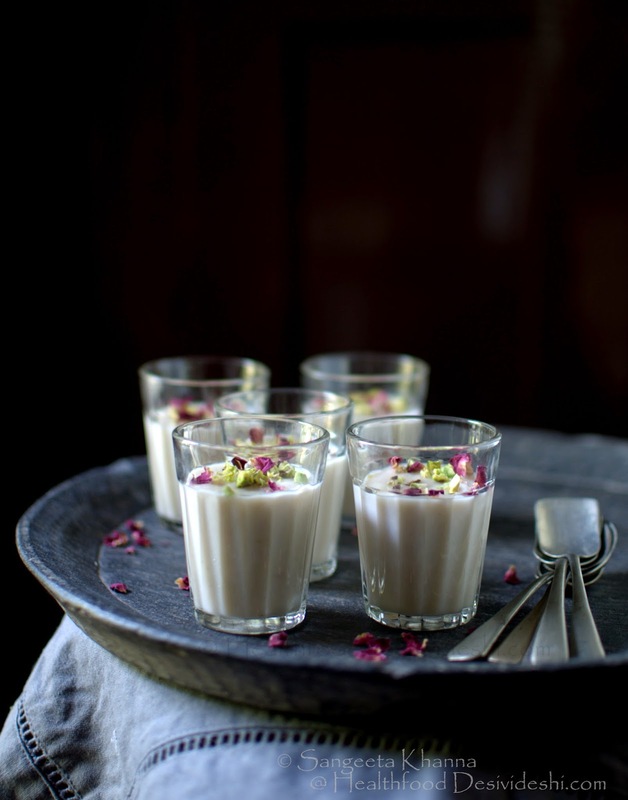 Garnished with pistachio slivers and rose petals this dessert was an instant hit and has been repeated a few times already. You know Arvind loves desserts for dinner and he would eat 2-3 servings and not have anything else for dinner. This is the reason I need to make our desserts healthier but thankfully he likes them very lightly sweetened and loves all the healthy desserts I make. But to be honest I don't like anything sweet so I can barely finish one serving of this panna cotta, although I love the taste too. 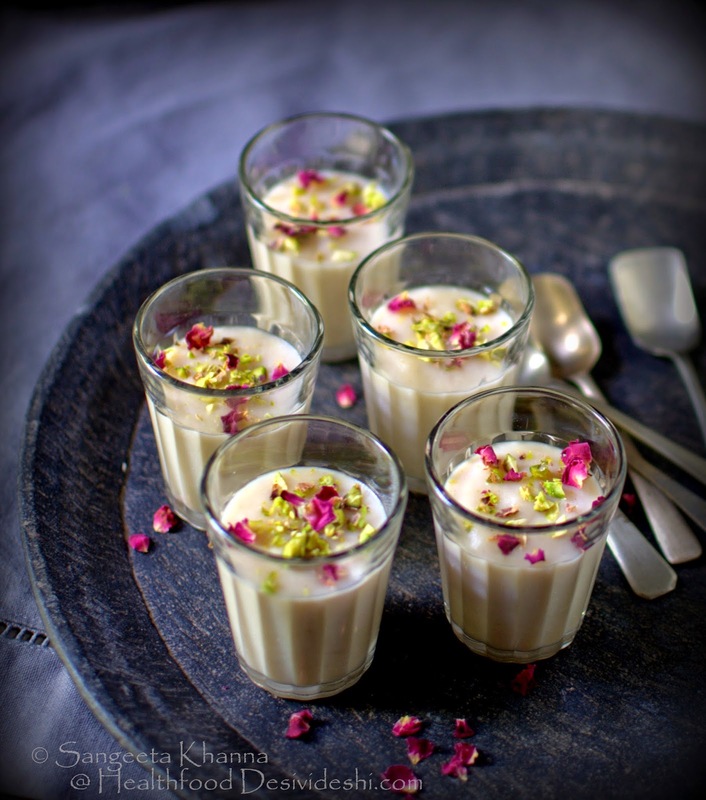 The detailed recipe of this fresh water chestnut panna cotta is shared on Pratibha's blog here. Another dessert of the same type I made was very different in taste and aromas. The dark beauty that treats the taste buds with some Tryptophan in dark chocolate along with whatever flavours you add to it. This is a chocolate pot de creme that doesn't use cream. Since fresh water chestnut puree is a good gelling agent and makes the dessert creamier, I used only full fat milk for this pot de creme and it was quite rich tasting. 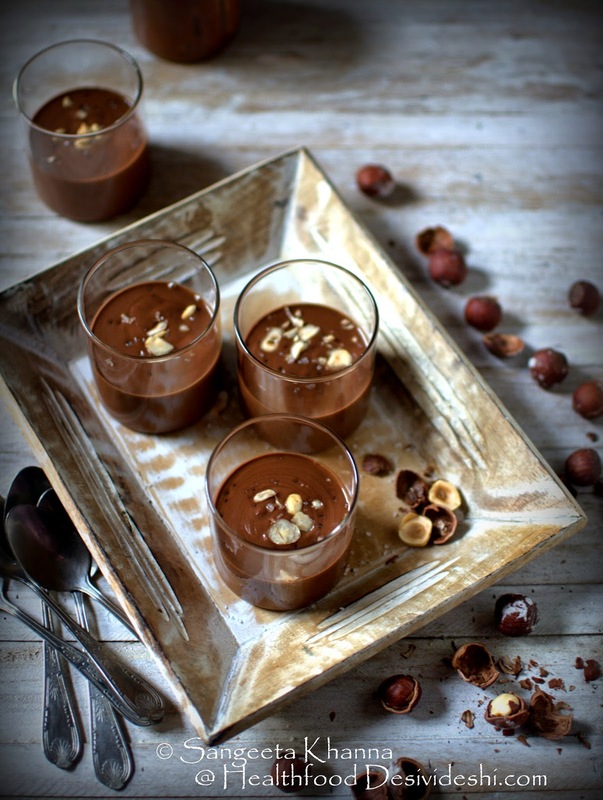 I used good quality dark chocolate (Callebout 72%) and a dash of nutmeg and cherry brandy to get deeper flavours in this chocolate pot de creme but you can add rum and your choice of spices to get desired flavours too. I sprinkled some seas salt crystals on top of the pot and it tasted really good. Mix the water chestnut puree and milk in a saucepan along with the sugar and heat it on high flame. Keep whisking all the time till it starts bubbling. 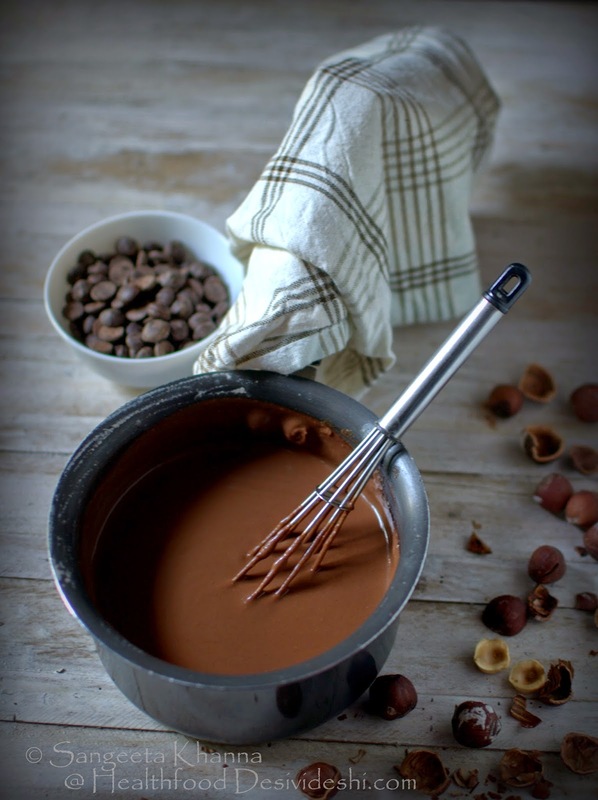 Take the saucepan off the fire and add the chocolate pellets and whisk till a smooth creamy mixture is formed. Add the liquor and nutmeg and mix well. Pour into serving glasses or bowls and chill before serving. Add the chopped nuts and sea salt at the time of serving. I have clicked these pictures while the chocolate pot de creme was still hot hence the sea salt crystals have sunk into the chocolate dessert. But it doesn't affect the taste at all. Now I must tell that I am myself not too fond of chocolate and hot chocolate is the only form of chocolate that I like and crave for in winters. So this chocolate pot de creme was diluted the next day with more milk and reheated in microwave and was had like a real thick and creamy hot chocolate. One of those desserts that even I would like as my dinner sometimes, piping hot in a large mug to wrap my fingers around. The nights are getting nippy. 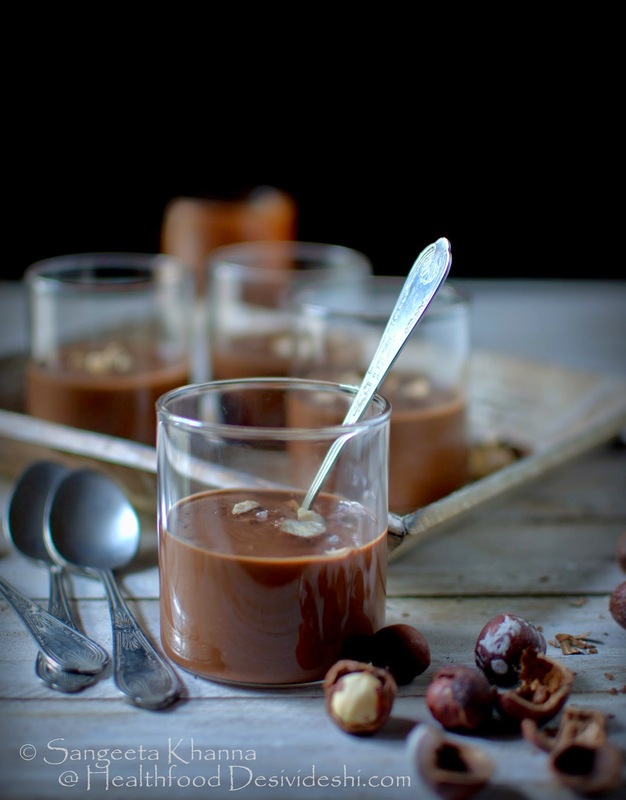 You would know how good this chocolate pot de creme tastes once you make it. And how easy it is to cook in a jiffy. Very low fat and mildly sweet so you can enjoy this treat even if you are on a diet. Do let me know if you cook these desserts using fresh water chestnuts. 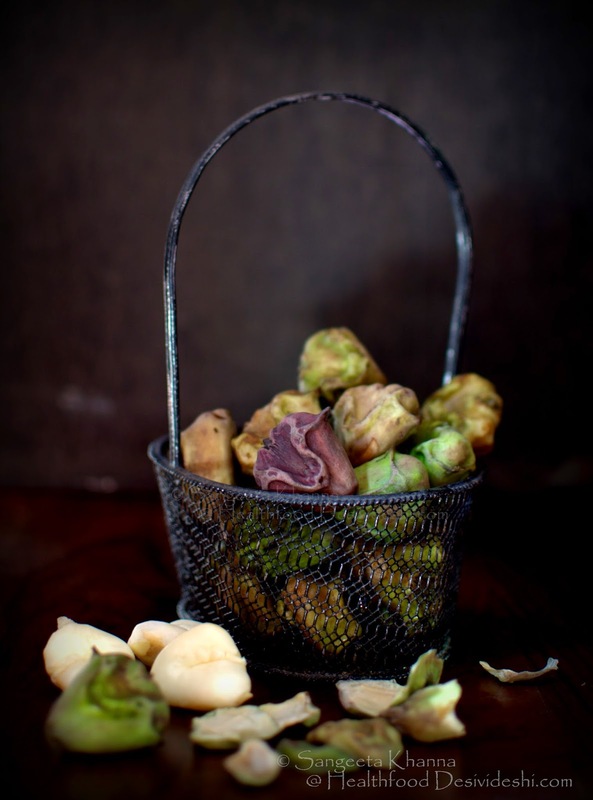 There is a thing in the seasonal bounty that makes it bursting with taste and fresh water chestnuts get a refreshing nutty taste when cooked with butter, ghee or cream this way. I have just exploited that property of fresh water chestnuts to makes these Panna cotta and pot de creme. Wishing you all a happy Diwali. It will be healthier too if you eat the right things. Please take care of what you put into your mouth in festive season too and trust me it is very much possible. PS : I must add to tell you that this pot de creme was so delicious when diluted with milk, heated in the microwave and had like a hot chocolate. Deep dark creamy hot chocolate to enjoy at the end of the day when winter is just knocking at the door. Also, please note that dark chocolate (72%) is not everyone's idea of a good chocolate. So if you are the milk chocolate person of like something between 55-60% dark chocolate, please go ahead and use your own favourite chocolate. I realised after serving it to someone who likes her chocolate really sweet and light. Hi Sangeeta, love this recipe can't wait to try it out. Do you think instead of using sugar, one could use fresh sitaphal pulp, or would that not allow it to set? 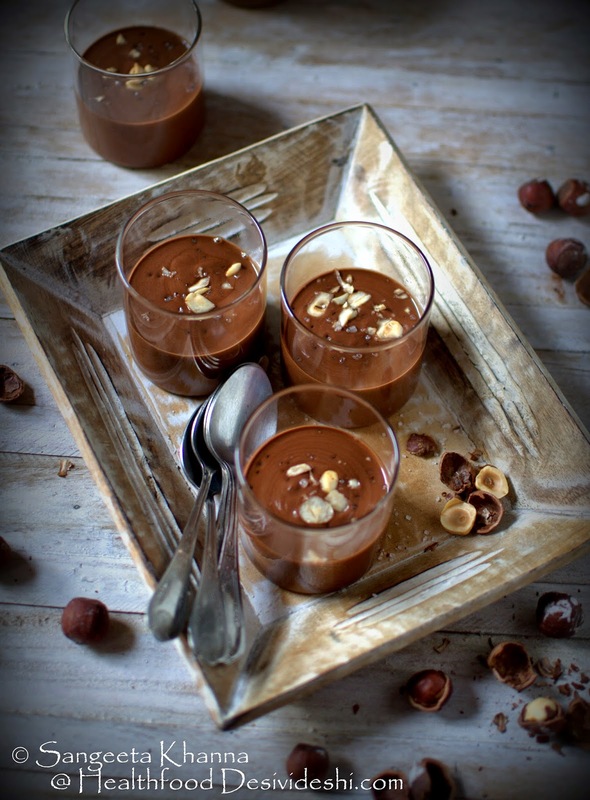 Sitaphal wouldn't set Karuna but it can make great mousse along with dark chocolate without cooking. Try that. Really innovative recipes I must say... As finding fresh waterchestnut at bangalore is not easy I wanted to ask if we can substitute singhare ka aata instead if fresh puree..?? Yes Astha the flour would work to set the desserts but the taste and texture both will be different. I suggest you try whenever you get fresh water chestnuts. You can try getting whole dried singhada, soak them overnight and then blend and use that. Makes a lot of difference. Hi! Are you able to taste the water chestnut in pot de creme?Does not the chocolate overpowerits taste? Hi Paayel, yes the chocolate pot de creme has almost no flavour of water chestnuts. The aim is to make the pot de creme lighter here. The pannacotta has a pleasant taste of water chestnuts. Hope it helps.